Luck doesn’t have a time frame, but just to be sure we like to act on it as fast as possible. The online realm of lottery sites allows punters to play our favourite numbers, or select them randomly with just a click of the mouse or a tap of the finger, whenever we want. Punters can access lotteries found at local newsagencies online, and participate in the biggest lotteries around the world. The following sites are based in Australia and regulated by the Australian government. This ensures player protection and regulation. Lottoland is quite unique when it comes to its services on offer. It was established at the end of 2015, but has been operating independently in a number of other countries around the world. It has quickly made a name for itself as it offers a wide range of overseas lotteries – the ability to pump up the multi-billion-dollar lottery in the USA played a large part in its quick success. It has also come under fire for the way it operates, earning regular news headlines. While Australian lotteries, such as Oz Lotto, Powerball, etc., allows you to pick your numbers and win with the matching ones, Lottoland sees players betting on the results of the lotteries. So instead of winning the money of the lottery, Lottoland pays the amount the player would’ve won had they participated in the actual lottery. 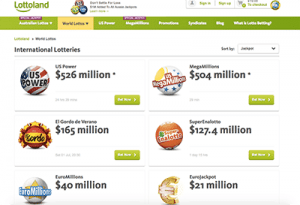 The service is also available for Australian lotteries including the major daily lotteries. Since the The Monday and Wednesday Lottos are different depending on the state – South Australia and New South Wales differ – the highest jackpot at the time is the lottery eligible to be wagered on. Purchasing tickets at Lottoland is incredibly easy. Simply locate the preferred lottery and then select your preferred numbers. Lottoland offers Quickies, which is a similar feature to Tatt’s QuickPick where the numbers are automatically, and randomly selected for you. This service is fair as confirmed by the license from the Government of the Northern Territory under the Racing and Betting Act 1983. Add your entries to your cart and checkout – you will have to create an account in order to pay and complete the transaction. This only takes a few minutes and once done you can pay with Visa, MasterCard, POLi, Paypal, BPAY, or paysafecard. There’s also a mobile app you can download via your smartphone or tablet. It is important to note South Australian players aren’t able to use Lottoland. Lottoland winnings will be transferred to a bank account which has been provided following the verification of your identity. The bank account must be under the same name you have opened your Lottoland account with due to Anti-Money Laundering legislation in Australia. There’s also promotions available at Lottoland including two for one entries for the US Powerball and more. Click on the Promotions page to see what’s on offer. WA, NSW, VIC residents are required to make a cash deposit before promotions become available, while QLD, TAS, ACT and NT residents can jump right into it. 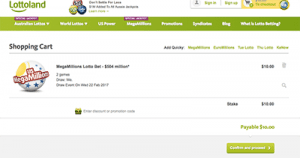 Oz Lotteries is an online retailer offering the lotteries you will find at your local newsagency. It allows you to purchase entries online for lotteries in which you participate in. The company is an authorised online retail agent of NSW Lotteries, Tatts and SA Lotteries, plus an accredited retailer of several Australian charity lotteries. 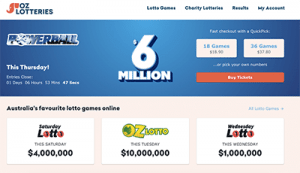 Lottery players from all over Australia are accepted here too, but Queensland lottery players can only purchase charity lottery tickets due to licensing agreements. It’s important to note, there’s additional costs involved in purchasing these lottery entries as opposed to buying them from a newsagent. These charges cover online security as confirmed by the NSW government. 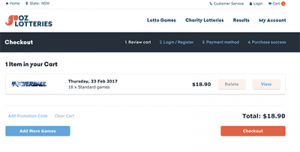 Purchasing lottery tickets at Oz Lotteries is easy. Once you’ve created an account pick your preferred lottery – you can choose more than one – and select your numbers, or simply add the ticket to cart if it is a charity lottery. Then proceed to checkout where you can pay with MasterCard, Visa, or PayPal. There’s an app available for iPhone and Android users you can download from the website to purchase your tickets on the go too. Oz Lotteries winnings can be withdrawn provided you have completed the identity check. South Australians have to do this before their account is activated, and Northern Territory members need to do so within 45 days due to state regulations. You will then be paid your winnings, which is the actual lottery prize, via a bank transfer provided by you to Oz Lotteries, or by cheque in the mail.